I have a thing for Neil Gaiman. I can't exactly explain what it is, but it's there. Now, this does not compare to the deep, unending, and (sometimes) irrational thing I have for Patrick Rothfuss,...but I can't deny there is something special in my heart for Neil's art, for his way of seeing things, and for his lovely, lovely storytelling. I became a fan of Gaiman's when I read The Ocean at the End of the Lane. It is a most unusual tale, a cross between a delightful faerie tale and a Grimm Brothers' nightmare. I loved it and reviewed that book in an earlier blog. Since reading that first book, I've sought out and read various books by Gaiman. Each one, so far, has been different than the others, but I've liked them all. I do have a thing for first loves, though, so my heart pulls most towards The Ocean at the End of the Lane. Most recently, though, I became enamored with Gaiman's novel Stardust. It's a delightful romp in a magical forest. It's about bringing together all the things that make fantasy fiction so much fun for me. There's lovely maidens, evil plots, handsome heroes, magical kingdoms, witches, faeries, ghosts, falling stars, magic spells, flying ships, unicorns, and...well,...love. What's a good story without that? Oh, you can have a good story without it, don't get me wrong, but it isn't usually the kind of story that leaves you with a big, goofy grin on your face. 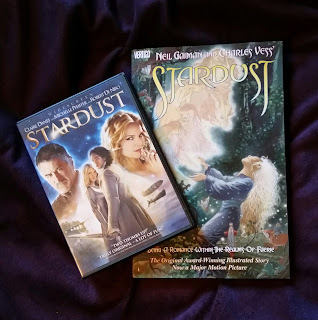 There is a part of me that would like to compare Stardust to William Goldman's The Princess Bride, but that's difficult for me to do because that particular book and movie have been near and dear to my heart for a very long time. I am a bit biased. Stardust does, however, glimmer with the same kind of magic, wit, fun, and good storytelling that is appealing in The Princess Bride. And, like The Princess Bride, Stardust was also made into a movie. Stardust is like the plain cousin of The Princess Bride. Not unattractive, but attractive in a different way. She's less complex, much shorter, a bit naughty, and not quite as witty, but she's a fun date and can dance a jig as well as most. Best of all, she will leave you with a warm smile at the end of the evening and, while she'll never be her cousin, she is worthy in her own right and deserves to be courted. Happy reading (and movie watching)! !